I have a confession: I love social media. My favorite platform is Instagram. I love social media not because I like sharing selfies (thought I've been known to snap a few) or publicly reporting every minute of my life. I love it because I have a growing appreciation for the power of social media. Power over society, power over emotions, power over the arts power in marketing and information. I spend an embarrassing amount of time thinking about the impact social media and digital communication has had on culture, personal communication, and international awareness. I'm careful with it, but I love it. Let me get one thing clear: there can be be a lot of pettiness on social media. Pointless arguments (looking at you, red coffee cups! The big question: are any Christians actually made about them? But that's a discussion for another time, like maybe last week), silly obsessions over celebrities, scams, false information, and far too many duck-lipped selfies, to name a few of the many problems. But every time there is a crisis, local, national, or international, social media is the place of connection. Social media is where people can publicly share their condolences, offer support and assistance (even make financial donations through Facebook! ), encourage, and call for action. Hashtags like #BlackLivesMatter, #BringBackOurGirls, #ICantBreathe, and #UmbrellaRevolution have absolutely transformed social media as users connect with one another, share stories and feelings, and call for unity in the face of the horrors which preceded them. I saw this on a very personal level a few weeks ago when my small university had to lay off a large percentage of beloved staff and faculty members due to budget cuts. I watched, largely in social media silence, as alumni, professors, and my fellow students turned to Facebook first with questions and confusion, but with increasingly hopeful and prayerful posts. The thousand students at my school even coined a hashtag to show support for our little university. 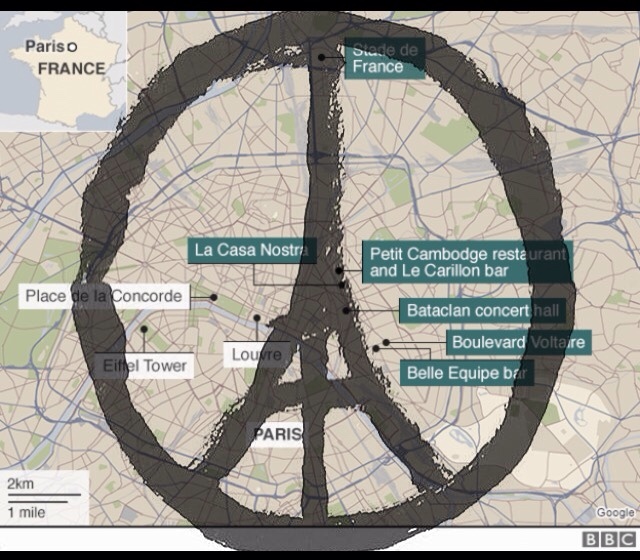 But on a much larger scale: Paris. from the Cincinnati Magazine: "Cincinnati stands with Paris. via Chris Seelbach"
In the hours since the attacks in Paris, I've seen at least half my friends change their profile pictures in support (an act which, I admit, does not make any concrete difference, but I see as a reminder of prayer and solidarity) of France. 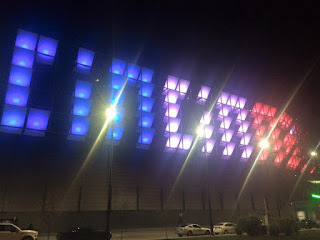 I've seen photographs of buildings all around the world lit with the colors of the French flag; even the Duke Energy Convention Center here in my hometown. I've seen reminders of other tragedies around the world, calling people to pray not only for Paris, but for the entire world. I've seen news articles shared. 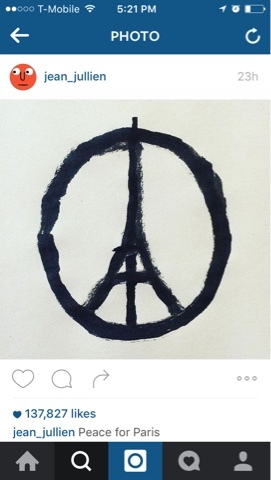 A simple painting of a peace sign with the Eiffel Tower in it by French artist Jean Jullien has gone viral, an instant symbol of peace and solidarity. I've seen images of kindness and love in the midst of tragedy. Facebook enacted its safety check-in system for survivors to alert their loved ones that they're safe. There's a Twitter hashtag (#PorteOuverte) letting those stranded in dangerous areas of Paris know where safe houses are. Hashtags like #PrayersForParis and #WeAreAllFrench are trending across the United States, as well as #PrierPourParis and #ViveLaFrance. There are also a lot of stupid things being said. A lot of anger, confusion, and misinformation. But a lot of prayer. The attacks in Paris are shocking, in part because they were focused on major social and cultural centers, not places of business or government. These attacks weren't declarations of war or defiance against political or economic systems. They were attacks on a highly creative culture. A city known around the world as the city of love. I can't help thinking that the worldwide social media response is fitting. An outpouring of love toward a city which has graced the modern world with more fine art, music, fashion, culinary art, and romance than any other city in the world. Let's not overlook the bombings in Lebanon or Baghdad this week, the earthquakes in Japan and Mexico, or even the attack at Garissa University in Kenya (which happened in April but is mysteriously circulating around social media once again, with many believing it occurred yesterday). But don't condemn the support the United States is showing for Paris, given the support France gave to the US in the wake of 9/11. So use social media. Embrace it! But post with care, share in love, be gentle and prayerful. Use it to share your own expressions of love, in honor of our hurting ally, France, and its beautiful City of Love. Post drawings of the Eiffel Tower and paintings of Starbucks cups in your favorite colors, poems in honor of those you miss, pictures with those you love, and selfies wearing clothing or jewelry from your favorite for-a-cause brands. Don't get trapped in the petty arguments or false information. Don't fall victim to scams. Please, please don't make duck lips! And most importantly, pray for Paris. Pray for Lebanon, Baghdad, Japan, and Mexico. Pray for New York, pray for London, Beijing, and Caracas. Pray for your hometown. My heart goes out to France, and to all those other places.